We are excited to announce and share with you the final Conference Agenda of the XENOWAC II 2018. We are thrilled and proud of the final result which would not be possible without your invaluable contribution. As you will witness, the Agenda has it all and it promises a both fascinating and very challenging scientific event! 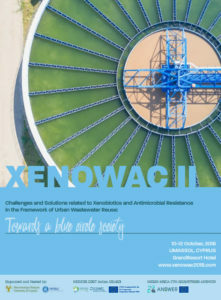 The full Agenda is now published on the Conference website and can be viewed here: http://www.xenowac2018.com/programme/. An updated version of the Agenda will follow within the next few days including information on the panel discussion. In anticipation of the upcoming Conference which is fast approaching, we have put together a video which will get you in the mood of what is coming up and what you will be experiencing in Cyprus https://youtu.be/E7B375dPIY8 ! We are really looking forward to welcome you all in Cyprus next month!